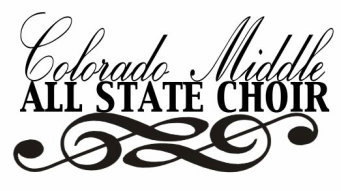 Rehearsals will be in the 500 and 600 Hallway of the Colorado Convention Center in Denver. Check-in will be in the 500 hallway from 11:30-2pm on Thursday. A director must pick up student packets and name-tags. PARENTS AND OTHER CHAPERONES WILL NOT BE ALLOWED TO CHECK-IN STUDENTS TO THE ALL STATE EVENT. Directors are responsible for their students at all times. This includes meals, time at hotels, and behavior during rehearsals. NO MEALS ARE PROVIDED FOR STUDENTS OR DIRECTORS. The Director's meeting on Friday morning is mandatory. Please inform your chaperones that they will be "on call" should any issues arise during that time. Lost and Found items will be available at the T-Shirt Table until the end of the event. We will also be collecting items after the concert, and those items will be held for 30 days before being donated. The Directors' Choir is optional for interested participating directors. Please come join us! Participants should purchase and prepare the music prior to the event. Tickets should be purchased online before the event. However, tickets will also be available at the door for a flat rate of $20, Cash Only. We will have a table set up with a board member present at all times for any questions you may have. T-Shirts will be available at all times during event, while supplies last. They are $20 each, Cash Only.